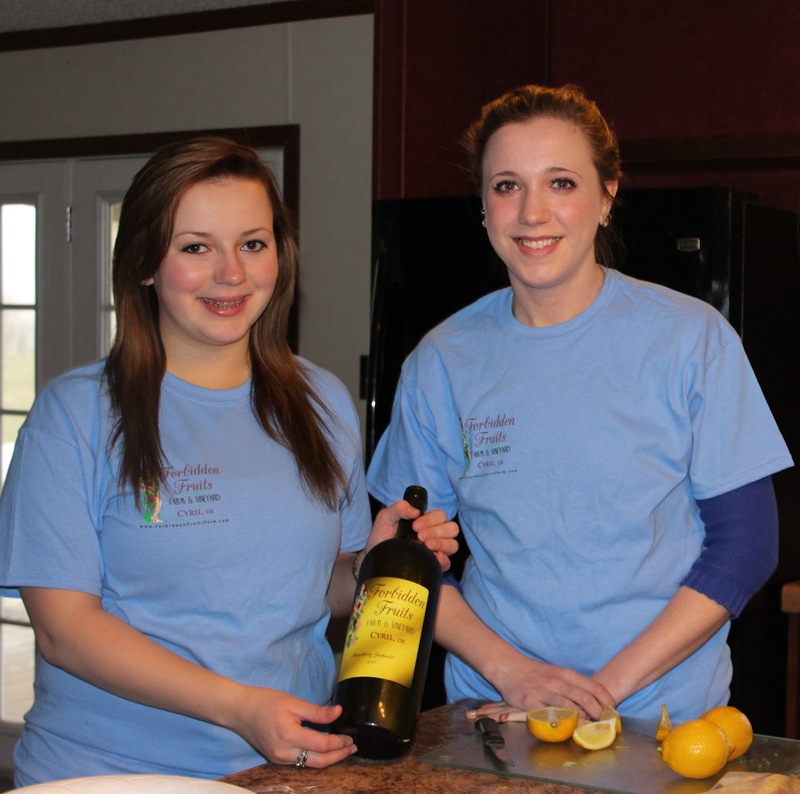 Vineyard-Planting Festival is a Huge Success! Thanks to our wonderful volunteers, our Vineyard-Planting Festival was a HUGE SUCCESS! The photo above shows the crew (after lunch and perhaps a little too much wine), minus two volunteers, Noel and Phoebe Kaiser, who left before this was taken (you can see them hard at work below). The day ran 7 1/2 hours. Most volunteers either worked all morning or worked all afternoon. By now, you have probably concluded that this was all a big marketing pitch to get volunteers to come help us plant our vineyard. They knew it too, but many of them are frustrated gardeners who don't get their hands in the soil enough. STEP 1: Prepare the soil. We cheated. We pastured the cattle on the vineyard land most of the fall, so we let the cattle (ahem) prepare our soil in the most natural way. They fertilized it for us, and also spread out hay to encourage earthworm growth. We didn't tell them our nefarious plans. They just thought the grass looked good. STEP 2: Tim used the subsoiler and the middlebuster to rip the rows for the vineyard. 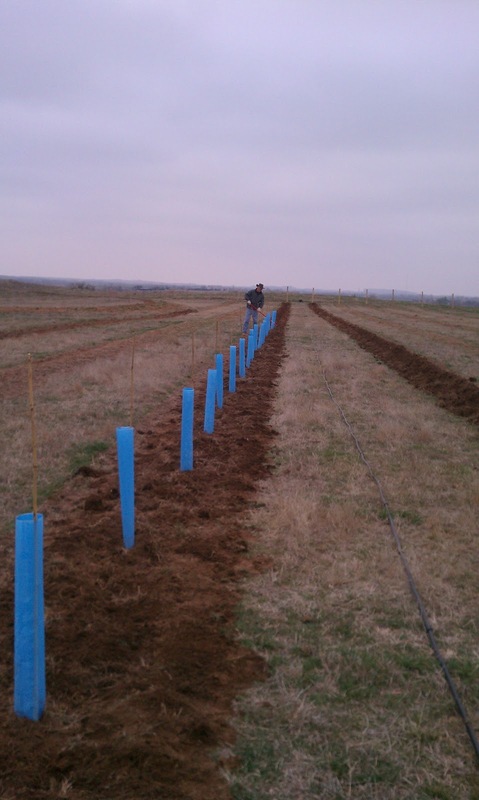 I am leaving out the steps involving the vineyard posts and the irrigation system, which also require installation. I talk about the posts in a previous blog. You don't want to rip the rows too far in advance or the soil will dry out. Tim ripped the rows on Thursday and Friday evening. Gentle rain fell between Thursday evening and Saturday morning, so the soil was moist and soft. STEP 3: Measure and position plants. Tim cut 2x2 boards to 7-foot lengths so that volunteers could measure the right distance from one plant to the next. Volunteers started with a bundle of vines, then, working in pairs, measured and positioned the vines. Another volunteer (or sometimes the same team) would go back and actually cover the roots of the vine with soil. Tim takes a bundle of vines to be planted. Tim hands off the vines to Matthew Chandler. Andrew Chandler is waiting with the measuring stick. Ashley Benoit and Jack Rucker measure and place vines. Matthew and Andrew work as a team to place the vines. Elisabeth Chandler works as part of a team to measure and place vines. Barry Chandler (father to all the fine Chandler children) plants a vine. Rebekah Chandler, dressed perfectly for the cold day, plants a vine. While most of the crew was working outside in the soil, a few of us were inside preparing the food and drinks. Trianna Gutzman and Rachel Kaiser were helping me in the kitchen. To our amazement, all 650 grape vines and muscadine vines got planted before lunch!!! That's ten 450-foot rows! This seemed like a good time to break for lunch. The Chandler Family enjoys the Greek feast. Jesse Wagner, Mike Kaiser, Ashley Benoit and John Dew relax at lunch. Phoebe and Noel Kaiser enjoy the feast. Jesse looks ready for an afternoon in the field. Tzatziki was one of the Greek delicacies served. Ashley REALLY enjoys the wine. With lunch over, we returned to the field. 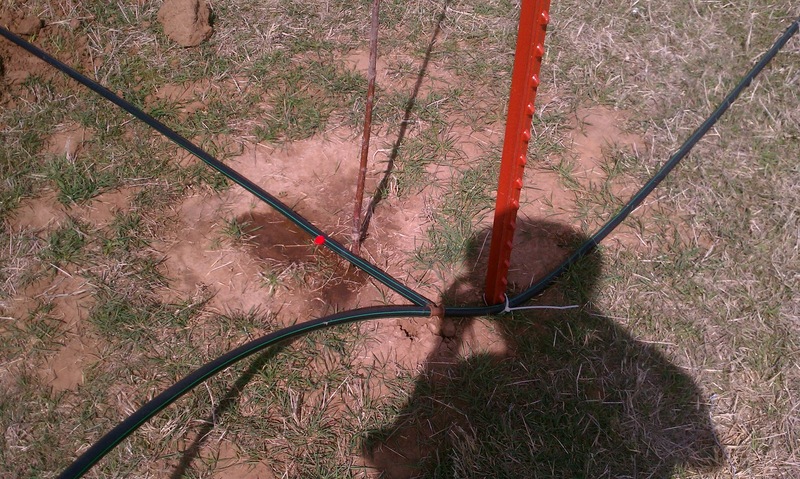 STEP 4: Build "grow tubes" and put "grow tubes" over the vines using bamboo sticks to stake the tubes in place. Jesse straightens out a bamboo stake. Barry Chandler with two of his daughters, Rebekah and Hannah. Sharon Allison inserts a bamboo stake into a grow tube. Katie Allison puts in a bamboo stake. Sarah Wagner, Ashley Benoit, and Stacy Curttright stop work to pose for a photo. John Dew installs a bamboo stake. Mary Allison poses for the photo. Tom Allison shows the kids how to roll grow tubes. Mike and Jack stop for a photo in between installing grow tubes. Linda and Matthew Chandler and Sam Allison build grow tubes. STEP 5: Stretch irrigation tubing down each row. STEP 6: Pound stakes along the row to support the weight of the vines on the trellises. STEP 7: Stretch wires for the trellis between the poles, along the rows, connected to each vine. THEN, when the vines are tall enough, they are attached to the wires and you're in business! The vineyard from the gate. Each of those things in the field is a grow tube on a vine. As you can see, it was a HUGE job. Thanks a million to the volunteers who made light work of it all! Tim and I had a very exciting weekend at the farm! After spending nearly a year reading about what's involved in starting a vineyard, Tim attending OSU's Grape Management Course, and many, many, many hours on the Internet researching suppliers and supplies, our vineyard came to life this weekend! In addition to the 650 grape vines we had ordered from Double A Vineyards in NY State, we had also ordered 60 blackberry bushes, which we planted right away. Since blackberries require a trellis to grow, we planted the blackberries in one of the rows with the end posts. The grape vines are mostly waiting until next weekend, for the Festival. We had planted 68 fruit and nut trees in November. 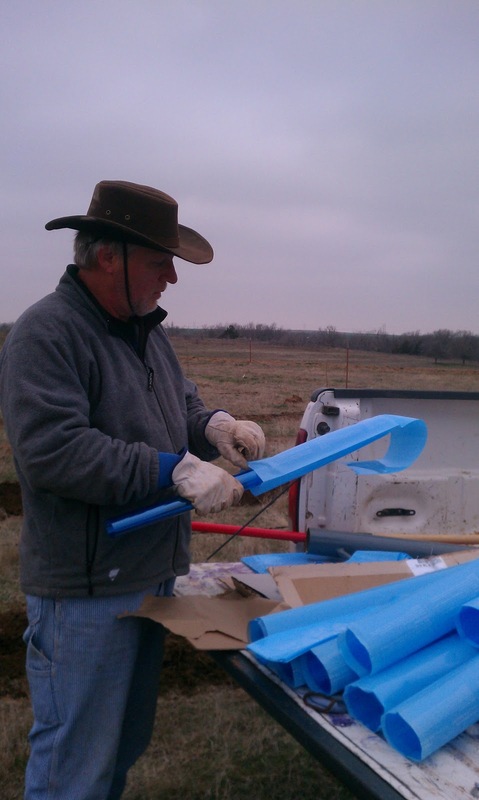 Tim got the drip-irrigation system finished up this weekend to the orchard: 1800 feet of pipes for the orchard. Each tree gets its own emitter. 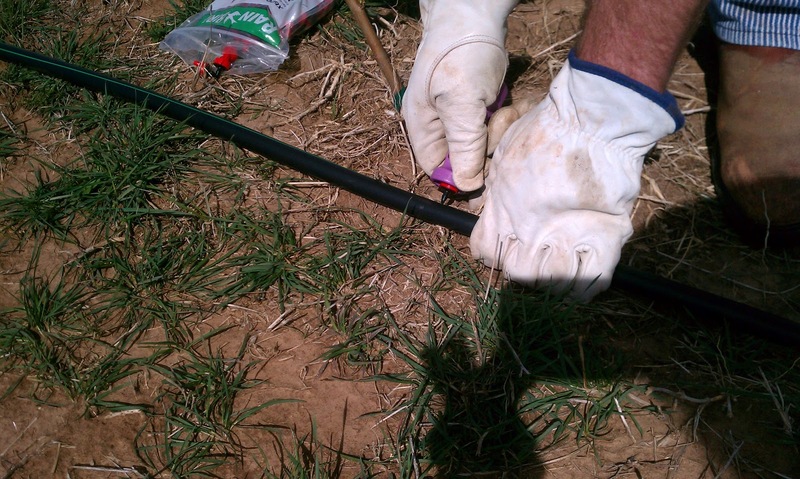 Tim installs an emitter in the tubing for a tree in the orchard. You are looking at an orchard, but the trees are just sticks at this point (many with leaves or buds), so all you can see at first glance is the irrigation tubing. 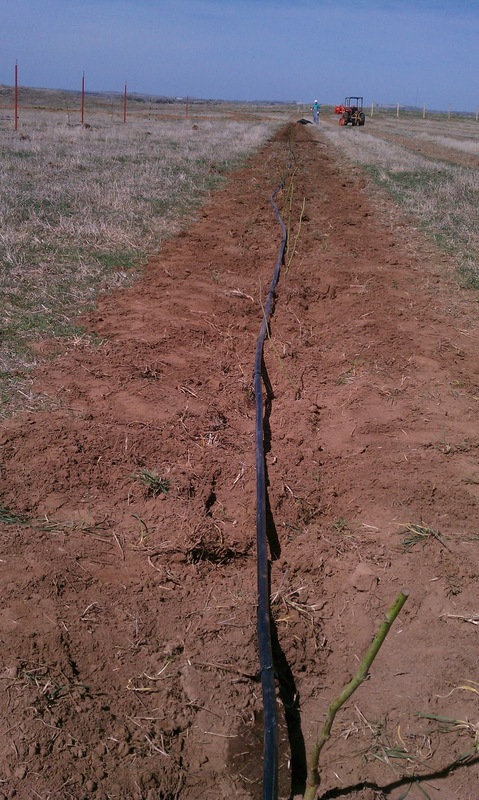 On Sunday, we got a row of Traminette grapes,a hybrid of Gewurztraminer and Johannes Sayve, planted. As you can see, they all have blue "grow tubes" around them, which forces them to grow straight up (saving us the trouble of training them) and also keeps critters away. Our first row of grape vines with blue grow tubes protecting the grapes. 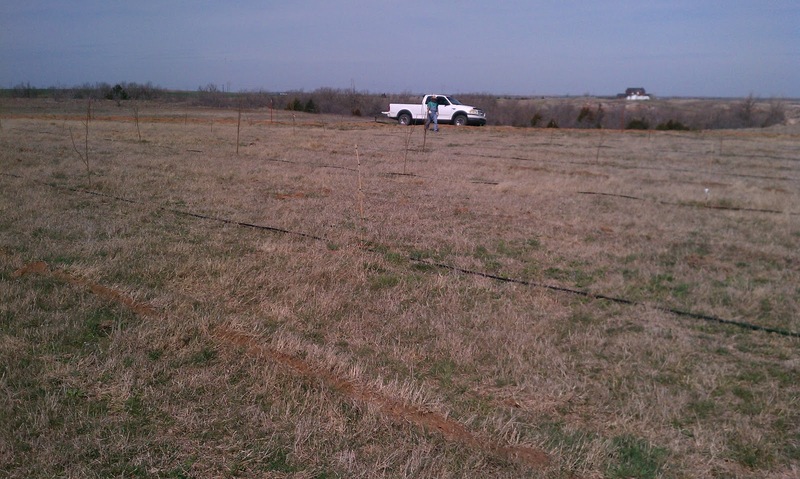 It has been a long road of planning, study, and preparation, and it is very exciting to have some grapes in the ground. We can't wait for the Grape-Planting Festival next weekend! With the help of our volunteers and family, we will plant 10 more rows. To give you an idea, one row makes 200-300 bottles of wine! We still have room for a few more volunteers, if you want to come help. Let me know! alexis@forbiddenfruitsfarm.com.